West Coast was awarded Intermediate & Reserve Grand Champion at the Hereford National in 2011 prior to being sold to McPherson Herefords for $25,000. 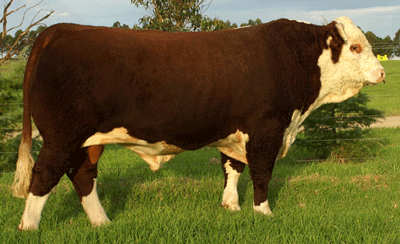 His Dam, Miss Titania 170, has sold seven sons to date, recording an average of $8,800. His first four sons sold to $7,000 at our 2014 Sale and another, Ballistic, sold for $9,000 to Greenhills Herefords, Yea at the 2014 Hereford National. We will offer more sons in 2015.